Digital media is likely to attract much more advertising revenues from India's growing sports industry in 2018, surpassing print. And sports will be the first major sector in India that would advertise more on digital than print media. "A major driver for this change would be that viewing on digital will increase. The other factors include various social engagements. Most of the teams today have got their digital assets, Facebook, Twitter and few others," said Vinit Karnik, Business Head, ESP Properties. According to a report compiled by GroupM's ESP and SportzPower, media spending in sports as a whole grew 15.8%, from Rs 3511 crore in 2016 to Rs 4065 crore, in 2017. Digital grew by 22.2%, up from Rs 270 crore to Rs 330 crore. Whereas, print shrunk massively from Rs 874 crore to Rs 356 crore. However, TV still continues to grow and dominate the category with total sports adex of Rs 3379 crore in 2017. GroupM-ESP India Sports Sponsorship Report 2017 had predicted that digital will soon overtake print vis-à-vis media spending on sports, both percentage wise as well as in absolute terms. What would push the digital sports adex growth is not only live streaming of matches but also the non-live sporting events such locker room scenes. "For example, RCB Insider has been having a sponsor for the property for last three years and this is only going to increase from here. This is the non-live part. Non-live programming bit will mainly scale up on digital, and in turn will boost its growth. Because TV is too mass for non-live," said Karnik. Karnik said that the number of new launches were low (launch of new leagues and teams) in 2017 as compared to 2016, which also hit the print revenues hard. He also said that it is tough to predict sports adex as it was still an evolving industry in India and the segment has still not matured. “We are not getting into prediction yet, because the industry is not mature enough. As an industry, sports needs to evolve more to be ready for forecasts. We are still building it and hence our report is called ‘Sporting Nation In the making’. Even small changes can have huge impacts on the industry,” Karnik said. The sports adex in India is primarily driven by cricket and the segment too was heavily dependent on IPL, the report has said. IPL digital rights holder Hotstar has not just built revenues on the back of IPL and other cricketing properties, but driven content consumption as well. "The biggest driver for Hotstar was the ICC World Cup in 2015. 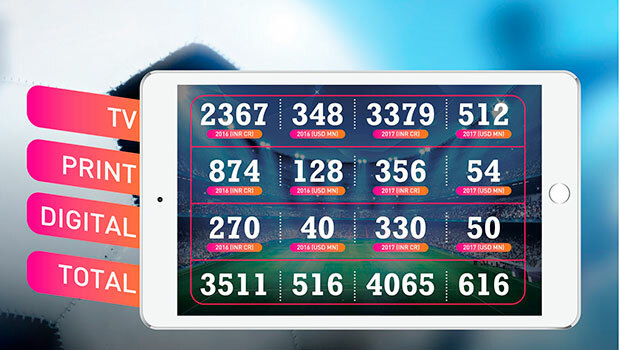 The number of downloads we got during that singular tournament was one of the most dramatic growths," Sanjay Gupta, MD, Star India, pointed out in a recent interaction with SportzPower. And Hotstar's ad sales growth numbers on the back of IPL are nothing less than spectacular. Sample this – In 2015, the first year that Hotstar leveraged IPL on its platform, it mopped up net revenues of Rs 22.25 crore. In 2016, that figure had telescoped 126.67% up to Rs 51 crore and closed 2017 up an even more massive 166.67% at Rs 136 crore. However, Star paid Rs 302 crore to the BCCI over the three years it held those rights. The BCCI is now hoping that digital rights for upcoming India's cricket matches would get good prices. The broadcast rights of India cricket are being auctioned by BCCI for a period of five years (between April 2018 and March 2023). Digital rights for IPL last year saw overwhelming bidding by broadcasters with Facebook bidding as high as more than Rs 3,800 crore. "I don't want to compare with IPL but it will definitely be the key driver. Because, from percentage growth point of view, digital growth will be far more than what broadcast increase would be. I can't quote a price but aggression will be digital only," Karnik said. Telecom players including Jio and social media giants such as Google and Facebook could compete for digital rights of India cricket. "For telecom companies they should be bidding aggressively from customer acquisition point of view. But I think a broadcaster with an OTT interest would be more aggressive. Sony and Sony Liv or Star India with Hotstar would be aggressive," Karnik added. Digital consumption will continue to grow massively and as adex increases, paid subscription numbers will too. Albeit, with a significant lag. Hotstar plans to drive subscription revenues in the back of IPL with a five-year plan. “We are dealing with very deep-rooted beliefs around ‘why should I pay any money’?” Gupta said during his interaction with SportzPower. Gupta further elaborated, “The mindset to pay has to come in. That’s a journey we are on. We will start using IPL to start moving people to subscription. But it’s not a switch on and switch off idea. It’s at least a five-year agenda. We are going in with our eyes open." "Primarily, in the first year or two, the value will come through advertising money. From the third year onwards, we should be able to start generating reasonable subscription revenues, to keep switching the business model on Hotstar (Star India's OTT platform)," Gupta added.